"So you really did the Demon Slab huh?" "Ahaha! I guess so! Looking back on it, it's like I did the climb all by myself." June 8th, 1924 at 12.50pm, was the last time that George Mallory and Andrew Irvine were seen alive. Observed very briefly during a break in the clouds from one of the lower camps by Noel Odell they were far, far up above up on the final summit ridge near the peak of Mount Everest. Then the clouds closed in once more and they were never seen again. To this day, despite the discovery of Mallory's frozen body on Everest's North Face in recent years, there is still no clear evidence as to whether they failed in their brave attempt to be the first to conquer Everest, or whether they reached the summit and were in fact on a triumphant descent when the weather closed in and disaster struck. The only hope of solving this mystery lies in finding Mallory's camera, which sadly was not on his body when it was finally discovered in 1999. 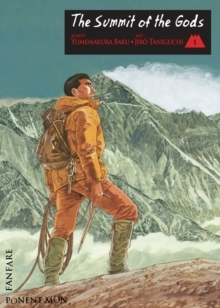 SUMMIT OF THE GODS is set in 1993 with Mallory's body still undiscovered on the mountain, and a Japanese photographer Makoto Fukamachi, seconded to a failed Everest expedition organised by wealthy Japanese executives, stumbles across a 1920s Kodak camera in a Kathmandu junk shop which he quickly realises is very probably Mallory's. Before he can do anything with the film, however, the camera is stolen from him, and we are introduced to the character whose life story, told in flashback, occupies the rest of this first volume. Enter Jouji Habi, one of the greatest and possibly the most single-minded Japanese mountain climbers ever. Not to mention the most social awkward and indeed certainly most obnoxious one. A true lone wolf who preferred to climb alone, he had simply disappeared from public view after a failed Everest expedition in 1985. So what, wonders Fukamachi, is Habi doing in Kathmandu, and what is his personal interest in Mallory's camera? Baku's writing has me totally engrossed: it's packed with characterisation and plot detail to rival any prose work. 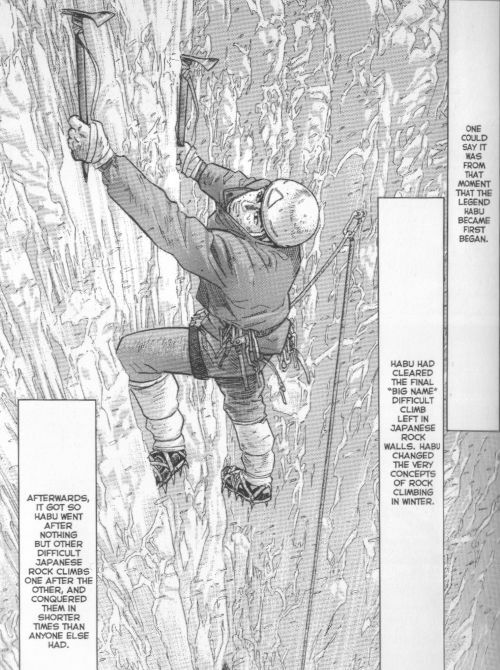 The story of Habi's early years as an upcoming mountaineer in Japan just grips you like a crampon and never lets go. I really wanted to read on at the end of volume one, but I already have no doubts that the next four volumes will be just as wonderful. To be honest, I'm just desperate to see where the story goes next! 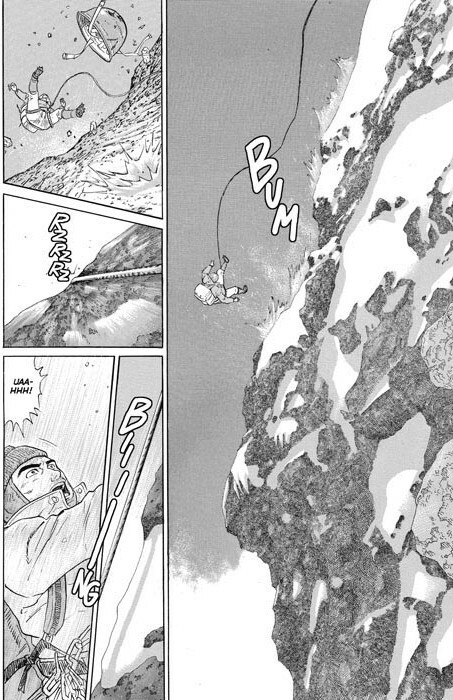 Taniguchi's detailed and realistic art, especially on the climbing sequences, really transports you and puts you right in the perilous position of those engaged in this most dangerous and foolhardy of pursuits. He captures the epic grandeur of the mountain range and really gets right into the devilish detail of precarious hand - well fingertip - holds. SUMMIT OF THE GODS has won a few prestigious prizes too, which I just mention to underscore the point that this is a series which is going to be regarded as a classic for years to come, so why not take a look? Winner "Best Art" Award at Angouleme Festival 2005, Winner "Excellence Prize Manga Division" at Japanese Ministry of Culture's Media Arts Festival 2001, and the original novel was the winner of the prestigious 11th Shibata Renzaburo Award in 1998.